If you want a large shed or workshop for your garden then you shouldn’t limit your search to just timber or metal buildings. This plastic shed from Grosfillex brings advantages that more traditional substrates don’t, foremost among these being the fact that it’s completely rot and rust resistant, it can’t be damaged by rodent or insect attack, and requires no painting or treatments. That can save a lot of time and money over the lifetime of the shed. It’s also, to our eyes, very good looking, with the customer having a choice of pastel colours. Once inside, you’ll notice just how much room for manoeuvre there is, and this is thanks not only to the generous width and depth but also to a roof and eaves height that is much taller than those we usually see. This makes it ideal for use as a workshop, particularly as the half glazed doors and one side window let a plentiful amount of light inside. 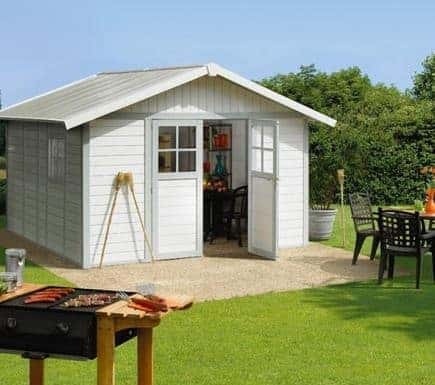 Whether you use this as a garden shed or a workshop for business or leisure, you’ll want to know that whatever’s kept inside is protected from intruders. That’s why it was good to see a sturdy key operated lock included as standard, a nice touch giving added value. 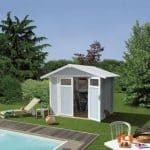 This large garden building features many of the design features you’d expect to see in a traditional garden shed, such as an apex roof, tongue and groove style cladding, and a half glazed door, and yet it’s made of PVC. Don’t let this put you off, because it’s low maintenance nature can bring significant benefits to the owner, and it also looks aesthetically pleasing in its subtle pastel shade. The thing we noticed first of all about this shed is just how tall it is, thanks to its rain repelling apex roof. 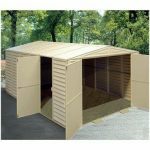 It has a ridge height of 2.50m and an eaves height of 1.88m, which means that there are no problems storing even the tallest items, and there is more than enough room to move around in. When allied to the overall width of 3.15m and the overall depth of 3.55m it means that there is a large storage capacity to take advantage of. Plastic sheds are becoming increasingly popular, and when we review them we pay special attention to the cladding as this has a direct impact upon how solid and stable they feel. We were glad to find that the cladding in this instance was 26mm, which is thicker than many we see. Modular in design, it’s also surprisingly easy to fit together. There is no floor included, as it’s made to be affixed to a level area of concrete. This area has to have minimum dimensions of 4.05 X 3.65m. One thing we would have liked to see at this price is an anchor kit that could be used to attach the shed to the concrete, but unfortunately this will have to be sourced separately. One of the things we like most about plastic sheds is that the only treatment they require is an occasional cleaning or hosing to keep algae at bay. They are also free from the possibility of rust or rot, which makes them very durable. That’s why we would have liked to see a warranty period that was even longer than the ten years given here, even though it’s unlikely that it will have to be called upon. We found the double doors to be another attractive feature, thanks to their contrasting colours and half glazed finish. What was most useful about them, however, was their size. With an opening width of 1.44m and an opening height of 1.80m, it opens up the possibility for larger and wider objects to be stored inside. For this reason, it could make a perfect place to store objects such as ride on lawnmowers or even motorbikes, keeping them dry at all times. Whilst the doors each have a glazed upper panel, there is also a window on the side. This is very useful, as it helps natural light get into the centre of the building. Ventilation is also provided, by way of vents in the gables. We were pleased to see this, as the end result is an interior that’s welcoming and pleasant to spend time in. We would have liked toughened safety glass to be used on a shed in this price range, rather than the standard glazing supplied. One way in which this building scores highly on security, however, is with the inclusion of a key operated lock on the double doors. It means that they’re very difficult to gain unauthorised access to, which gives excellent peace of mind. 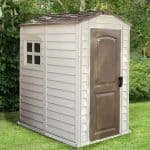 This shed doesn’t come with a lot of optional extras, which shows how much is included as standard. One extra that must be purchased however is an anchor kit, such as a set of Hilti screws, but unfortunately these will have to be sourced and bought separately by the customer. 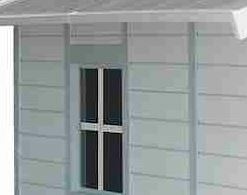 One option that is available, and that we very much appreciate, is the ability to select the shed colour. Two shades are available: blue and green, and they are both very subtle and pleasing pastel colours. We think it’s good that, through this choice, the customer is given the chance to customise their own shed at no extra cost. Whilst the components as a whole were very high quality, as exemplified by the thick interlocking cladding, we would have liked to see tougher glazing used. Given how tough PVC is, we would have expected a longer warranty period to be offered, so don’t be surprised to see this last for much more than 10 years without any problems. We were pleased to see an eaves height of nearly six and a half feet, as this creates lots of vertical storage space to complement the depth and width. It was surprising to see just how quickly this large building can be assembled, thanks to its modular design. With a friend’s help, expect to take around four hours. 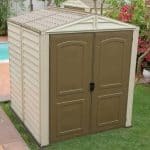 This certainly isn’t the largest shed we’ve seen at this price, but as it’s very well made, long lasting and practically maintenance free, we feel it provides good value. 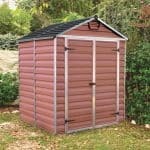 Final Thoughts: If you’ve never owned a plastic shed before, then this is certainly one you should consider. Annual treatments of timber sheds can be laborious, and metal sheds also bring worries about rust, but this PVC building is free from both of those restraints. 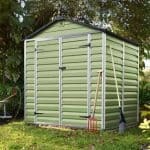 In our opinion it’s also a very attractive shed, whether in pale blue or pale green, and so you won’t need to be concerned about it standing out obtrusively in your garden. 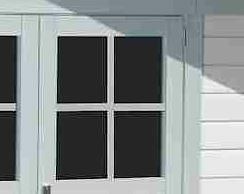 It’s large enough to be used as a workshop, and the side window and integrated vents will then come in particularly useful, as will the security enhancing key operated lock.